While on holiday in devon we went to Kents Cavern which is just outside Torquay, which is a prehistoric cave, entrance prices are 8.95 adults and 7.95 for children / seniors. If you book tickets online you can save 15%, unfortunately we didn’t do that and couldn’t book the ticket online on my phone as the mobile internet signal was weak around the area we was stopping. You have to pay for parking at about 2 for 4hrs, just a quick tip depending on which way you would get to the car park if you are coming with the car park on the left it’s a very tight turn to get up the hill into the car park. The entrance fee gives you a guided tour of the caves this takes about 50mins to an hour, so depends on what time you get there, there maybe a wait to go on the tour, there is a gift shop and a cafe/ restaurant with a nice terrace. there also is a woodland trail that you can walk around, unfortunately the day we went the weather wasnt great and was raining heavily so we didn’t go on the woodland walk. Inside there are kids activities where they can do brass rubbing of different things and boxes full of sand that you can excavate with little paint brushes to find the fossils there are also small stones /gems to find. There are information boards about the tool that humans have used over the ages from the stone age. This is very informative and enjoyable for the children. On the tour you are shown in to the cave, our guide for that day was Alan, he was very informative about the cave etc. you are guided around the cave, be careful if it has been raining as can be a bit wet like the day we went and people with walking difficulty’s need to take care in certain parts as some bit steep and can be slippy. As you are guided around the cavern the lights from the section before are turned off, but if you need to get out for any reason ask the guide and you an get out with assistance. Like I have said the tour takes around an hour where it explained about the history of the cave and how it was excavated. 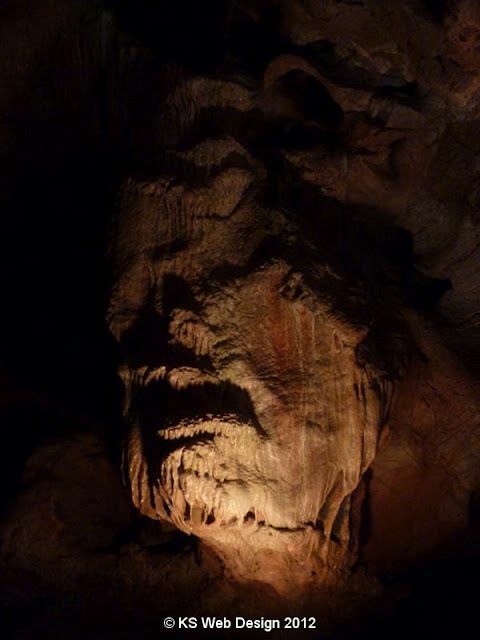 You see lots of great thing including a rock formation that looks like a face as in the photo at the top of this post, also stalactites and stalagmites and one in particular that water constantly drips on that is growing year on year but by only a few millimetres. The guide also explains about the animal that also would have been in the caves at some point you have lighting and noise effects, this may be a bit scary for very young children at one point our guide selected someone on the tour to guide to the next part, this on our visit was my daughter who did well though at one point nearly went the wrong way 🙂 . At one point the guide shows you how much light there would be from two moss candles then show how dark if there is no lighting, which is very dark. At the end of the tour you are in a part of the cave that has displays of cave men and bones etc, which is very nicely done you can spend as much time in this part as you want. We really did enjoy the tour even though we did get dripped on a bit, but is well worth it as was very informative and a great experience, see some of the photos below, as you are allowed to take photos with or without the flash but are not allowed to take video footage. From the building you can get to coastal walks and at Kents caverns they do have special event for Halloween and also in the summer nights ghost tours, which i would assume this would be great and spooky. All in all I would recommend going even though the main tour is only an hour, but if you get the discount tickets from their website www.kents-cavern.co.uk it makes great value for money, it is unfortunate the day we went the weather wasn’t great else we would have enjoyed the woodlands trail.